Hubble Space Telescope Images of M87. At right, a large-scale image taken with the Wide-Field/Planetary Camera-2 from 1998 (NASA and the Hubble Heritage Team (STScI/AURA), J. A. Biretta, W. B. Sparks, F. D. Macchetto, E. S. Perlman). The two images at left show an image taken in 2006 with the Advanced Camera for Surveys’ High Resolution Channel. 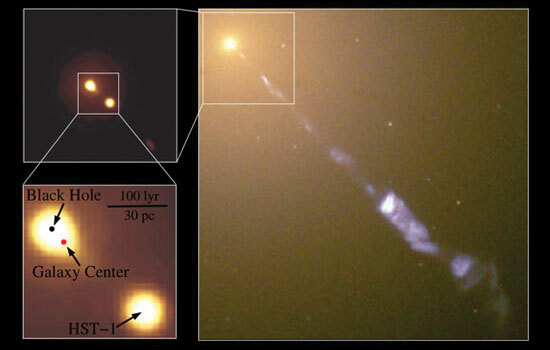 The position of the supermassive black hole is indicated by the black dot in the lower left panel, and a knot in the jet (HST-1), which was flaring in 2006, is also indicated on this panel. The red dot indicates the center of the galaxy’s light distribution, which is offset from the position of the black hole by 22 +/- 3 light years. A team of scientists from Rochester Institute of Technology, Florida Institute of Technology and the University of Sussex has discovered that the supermassive black hole at the center of the most massive local galaxy is on the move. The discovery, made through observations of the Hubble Space Telescope data, will help scientists refine their understanding of how galaxies are made and how they evolve. Messier 87 is a massive elliptical galaxy that, at 60 million light years from Earth, is one of our most impressive and closest galactic neighbors. It is known for its brilliant and dense nebulae of stars and a distinctive jet of sub-atomic particles that is propelled from its active center. The team has found that the supermassive black hole thought to be at the center of M87 has been is displaced. The most likely cause is a previous merger between two older, less massive black holes, but the displacement may also be due to the propulsive energy of M87’s iconic jet. “The M87 jet may have pushed the supermassive black hole away from the galaxy center,” says lead author Daniel Batcheldor, assistant professor of physics at Florida Institute of Technology and former research scientist at RIT. Earth’s own galaxy is predicted to merge with the Andromeda galaxy, which could then result in a similar wandering SMBH at the heart of the new galaxy–in about 3 billion years. The research was presented at the American Astronomical Society Conference May 25 in Miami and will be published as “A Displaced Supermassive Black Hole in M87,” by D. Batcheldor, E. Perlman (Florida Institute of Technology); A. Robinson, D. Merritt (Rochester Institute of Technology) and D. Axon, University of Sussex, Astrophysical Journal Letters. For more information, contact Andrew Robinson at 585-475-2726 or axrsps@rit.edu or Daniel Batcheldor at 321-674-7717 or dbatcheldor@fit.edu. About RIT: Rochester Institute of Technology is internationally recognized for academic leadership in computing, engineering, imaging technology, and fine and applied arts, in addition to unparalleled support services for students with hearing loss. Nearly 16,800 full- and part-time students are enrolled in more than 200 career-oriented and professional programs at RIT, and its cooperative education program is one of the oldest and largest in the nation.